I never cease to be amazed at how quickly Pbama Cultists can spin one way and then another in reacting to an issue based only upon political ideology. Facts? Tossed out the window. Logic? Pffffffft! What's that, ask Pbama Cultists. Obama administration officials and lawmakers lambasted plans by American International Group Inc., the insurer rescued by the government, to dole out $1 billion in bonuses and retention pay to employees. 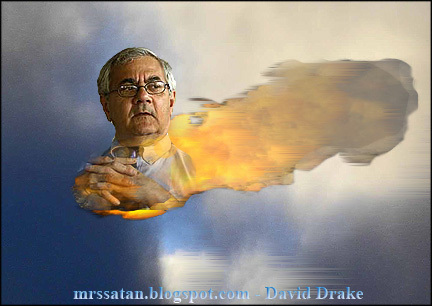 Uh - yeah, spBarney spFrank is the pot calling the kettle black, considering he and Democrat Chris Dudd are two main parties that let Fannie Mae and Freddie Mac disintegrate, despite multiple warnings over several years from President George W. Bush and Alan Greenspan. So happy are Pbama Cultists to see Wall Street fail, they fail to recognize that Wall Street directly effects - for good or bad - what happens on Main Street. AIG disclosed on Sunday that European banks including Deutsche Bank and France's SocieteGenerale were among the biggest beneficiaries of the taxpayer bailout of the insurer. Sunday's disclosure that more than $90 billion (65 billion pounds) has been paid to various banks -- including Goldman Sachs , Merrill Lynch and Bank of America -- since AIG nearly went bankrupt last September could stoke further public outrage about a bailout which already has many politicians up in arms. European banks that received funds from AIG since its bailout include Royal Bank of Scotland, UBS , Societe Generale , BNP Paribas , Banco Santander , Danske , Rabobank , and Calyon, part of Credit Agricole. Does Société Générale ring a bell? It should, because it was the center of a scandal over rogue trader Jérôme Kerviel. Wall Street donated to Pbama 3-to-1 the amount it donated to John McCain in the presidential campaign. Never forget this. French prosecutors say they are seeking a 2.2m euro ($2.22m) fine from billionaire financier and philanthropist George Soros, who is on trial for alleged insider trading. The case revolves around allegations that Mr Soros used insider knowledge of a 1988 takeover bid for a French bank to make money in a share deal. Personally, I think AIG should be able to pay out bonuses that they promised. I don't buy their lame PR excuse that because these bonuses were promised prior to the bailout, they have to honor them. Look, this is business - nothing is honored any longer. Bad PR on their part. I can't wait for AIG and Société Générale to start creating good American jobs at good wages for American workers. Where do I apply? Get on board the Buy-In Gravy Train! I'm having a hard time following you. you approve that the bonuses should be paid, but you're against them if the company revoked their promise? What dave? I am for the bonuses, I think they should be paid out. I think AIG using the "well, we made these promises" or "contractual obligations" line to make it seem like they couldn't get out of paying the bonuses is lame. They should have just said, "we made this decision and we stick by it" instead of trying to weasel out of it by mentioning the contract. There is little sanctity remaining to what any parties agree to under a contract. If AIG wanted to, they could decide not to honor the contract, which might result in them being sued. It happens every day where a party to a contract decides they no longer want to be a party to it. Did you know that George Soros would not be a multi-billionaire if it were not for the international language Esperanto? Born in Hungary in 1930 as Gyorgy Schwartz, the family changed its name in 1936 to Soros, which in Esperanto means "to soar." The Soros name-change was an effort to protect the Jewish family from the rise of fascist rulers and the whole family spoke Esperanto at home. As a native Esperanto speaker, (someone who has spoken Esperanto from birth), George Soros defected to the West in 1946, while attending an Esperanto youth meeting in Vienna. Esperanto enabled Soros both to defect, and to become the 28th most wealthy man in the World, according to the Forbes rich list. okay. you think the bonuses should be paid out. unless AIG decided not to pay them out by saying they're not going to honor the contract? I agree with you alot Dave, but you're not making sense to me on this. I had heard of Soros' ties to Esperanto. And I knew about the name change, which, everything I read said he did to avoid his name revealing his Jewish heritage...that he's a self-hating Jews who sided with the Nazis and was a war profiteer. EC - yes, that's basically it. I think the bonuses should be paid out. That AIG used the "we can't do anything because of the contracts" is lame. They can renege on their contracts, its done every day. Now, with this notwithstanding, the bonuses should be paid as agreed to. Yeah, it's not one of my more linear lucid thoughts, but that's where I'm at on this issue. I agree Simon. AIG was able to make poor decisions in the past because they didn't "owe" the govt anything because they hadn't received taxpayer money. Now...it's a different story. I have been against all bailouts and stimulus bills, regardless of political ideology.